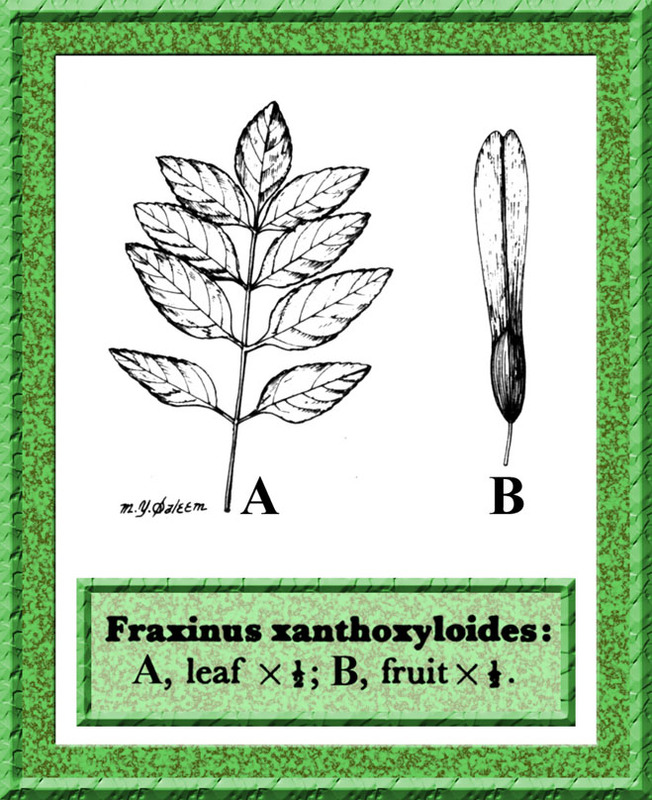 Fraxinus xanthoxyloides (G. Don) DC., Prodr. 8:275. 1844. (as Fraxinus zanthoxyloides); Boiss., Fl. Or. 4: 41. 1879; C.B. Clarke in Hook. f., l.c. 606; Parker, For. Fl. Punj. ed. 3: 313. 1956; E. Murray in Rech. f., Fl. Iran. 52: 6. 1968. Shrubs or small trees. Bark grey, smooth and lenticellate when young, dark and much cracked on older stems; branches stiff. Leaves opposite, 8-12 cm long (on shrubs sometimes only 2 cm long), midrib winged; leaflets 5-11, up to 4 cm long and 2.5 cm broad, ovate-lanceolate or ovate-oblong, crenate, glabrous or slightly hairy on midrib beneath, sessile or subsessile. Flowers in dense heads, appearing before or with the young leaves on shoots of the previous year; bracts wooly, brown. Calyx lacking in male flowers, small and persistent in bisexual flowers. Corolla lacking. Filaments short, anthers oblong. Samarae spatulate, often emarginate, 3-4 cm long, in dense fascicles, rachis hardly 5 mm long. Fl. Per. : April. Fruit: October. Type: “India orientalis ad Sirinaghir” Wallich 2833 (K,W). Distribution: Afghanistan, Pakistan, Hindukush and Himalayan mountains. In Pakistan common in the northern zone and Baluchistan, in temperate valleys, 1000-2500 m. The wood is hard, white and close-grained; used for tool-handles and walking sticks. The foliage is used as fodder.